I don't typically take a clutch to go shopping; having to dedicate an arm to holding a bag is not conducive to efficient rack browsing. But my things were in it from the previous evening and I didn't feel like switching. I went to Loft, J.Crew Factory, and TJMaxx. I left without making a single purchase. Do I blame the clutch? Oh no, clutches are not conducive for shopping at all! But it is super cute! I really want a leopard clutch, but I haven't found one that I love and that isn't crazy expensive! wow, i admire your resistance haha... i'll try bringing a clutch next time and see if it works for me too haha. anyway i love the clutch tho! pretty! This is why I am not a big clutch fan. But it could be good for trumping shopping habits? I love the outfit, though. Very cute! Great neutral outfit. The clutch may not have been conducive to shopping, but it certainly offers the perfect pop! Those sandals are just too cute on you, too. I absolutely love the simplicity of this outfit! The clutch and the jewelry make it perfect. Ah, I hear you on taking the wrong bag shopping. At least it's stylish! Love your sandals too! Blame the clutch! haha I am just kidding. But it's a good theory though. Really pretty look for shopping .. I do really like the clutch with it! I am in love with that clutch!!! It's amazing. I love grey and white together and your clutch is very cute! That's amazing that you were able to resist shopping at all of those stores! I think that last shot is so good - and I feel the clutch adds instant style and yes the clutch kept you from shopping. I know, I love carrying clutches but they just arent practical very often. Hard to shop and impossible to fit in all the stuff my 2 year old needs...I usually wear a clutch in the evening. Lol, it might be. I can't shop with a clutch since I need both hands to dive into the racks! I love that clutch though! Simple and yet so fab look for shopping. Your accessories are just wonderful addition to this look. I have been lately leaving shops without purchases as well. Maybe it's weather changes, feels like slowly Autumn is sneaking in. Love this outfit. Those shoes are killer! It's funny, I'm the opposite - I always find that the smaller the bag I have, no matter what I'm doing, the easier time I have using both of my hands. Which is essential when shopping ;) And really, that clutch is so adorable, it deserves to be taken out time and time again. The simple excuse of not wanting to change purses (which, by the way, is totally legitimate) was more than good enough! Neutrals will never stop being chic, you look amazing! I totally love clutches so much that I confess I have far too many to ever use on nights out... So I am going to take mine shopping too! :D Good idea! HaHa! It is hard to shop with. Love the grey and white palette. The clutch looks gorgeous with it. I adore that clutch, but I hate carrying one. If only I had 3 hands. I have the same clutch and love it. Wow! Way to resist! I love that clutch so don't blame the clutch! I wish I had an extra hand for a clutch so I didn't always have to use a bag! The clutch struggle. So worth the loss of convenience. I adore yours and this entire outfit. You look fabulous. 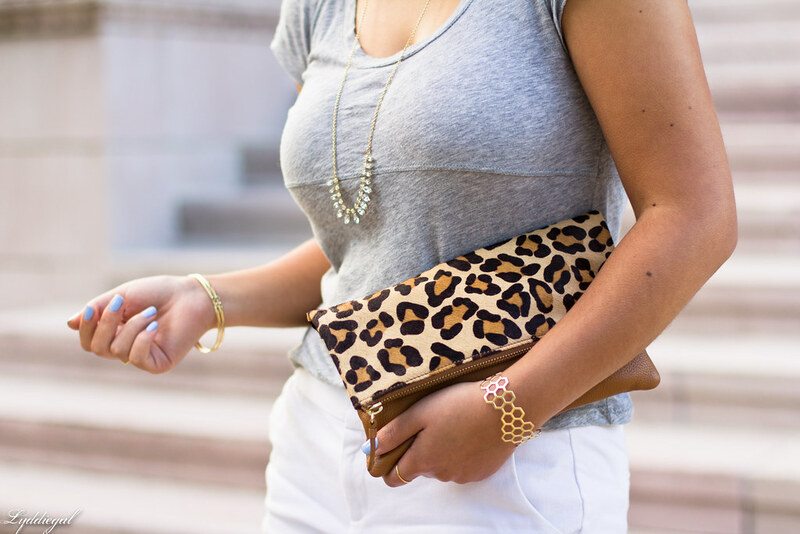 I love a good neutral look and I love how you added some pizzazz with the leopard! So cute! Well the clutch looks perfect with this neutral outfit! I'm the worst at switching purses. I pretty much just have four purses, one for each season, that go with everything. Not very fashionable, but I know I won't switch everything around! I love that you accented your neutral outfit with a fun pop of animal print! Classic with a fun leopard pop. Love this! 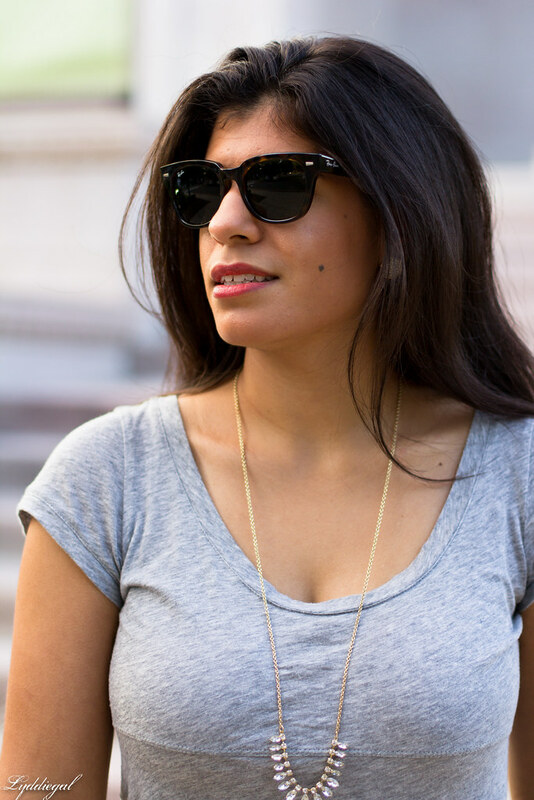 Love this simple yet chic look! The leopard with it is absolutely perfect too! And the hint of sparkle is so fun! It's so hard to resist a cut clutch! Practicality sometimes has to go out the window. ;) I hate it when you go shopping in search of something and come up empty. Loving the clutch!! Such a great addition to this outfit! LOL! I would blame the clutch, but I was just in the mall and came home with nothing too. I think it's an in between time. I'm waiting for true fall arrivals to come, then I might loose my cash. I think all clutches should come with removable straps so you can go hands free if you want. I love clutches but they are a pain to take shopping. I'm always afraid I'll put it down somewhere and then forget it! I'm so glad I found that leopard clutch because it's so cool!